Today we hear from guest blogger, Diaconal Minister Lauren Morse-Wendt. On the eve of Thanksgiving, we wanted to highlight and share a wonderful idea from the extraordinary congregation Edina Community Lutheran Church. At Edina Community Lutheran Church we are always seeking new and active ways to engage in justice, so during this season of Thanksgiving, I wanted to share this as a simple and powerful activity for other congregations to try as well. Our congregation is committed to mission and justice, and we often hear from parents and grandparents that they seek more opportunities to connect their children to these values. But, most volunteer organizations are have a minimum age limit, so we’ve stretched ourselves to come up with opportunities accessible to all ages. Throughout the month of November, we reminded the congregation to donate food and hygiene items to our regular food shelf partner. By Christ the King Sunday, we had a hallway overflowing. It took only twenty minutes to transform the sanctuary into a labyrinth, turn on some meditative music, and invite babies to crawl, toddlers to toddle, and children and adults to prayerfully walk through the labyrinth praying about hunger and our part in both creating and ending it. Our faith, our worship, our call to seek justice are intertwined…but sometimes we need a tangible reminder. 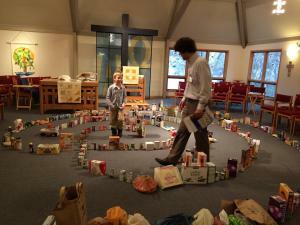 Physically moving the altar following worship, building a prayer labyrinth out of donated food, and prayerfully walking through the food itself was a physical reminder for what we as Children of God are called to do in this world. 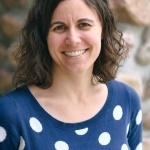 Proclaim member Lauren Morse-Wendt is a Diaconal Minister serving as the Mission and Ministry Developer at Edina Community-Lutheran in Edina, Minnesota. When she’s not joining her faith community in advocacy acts…she’s at home with her wife advocating for their 2 year old to go to bed before 9 p.m. This entry was posted on Wednesday, November 26th, 2014 at 8:05 am	and is filed under Blog. You can follow any responses to this entry through the RSS 2.0 feed. Both comments and pings are currently closed.